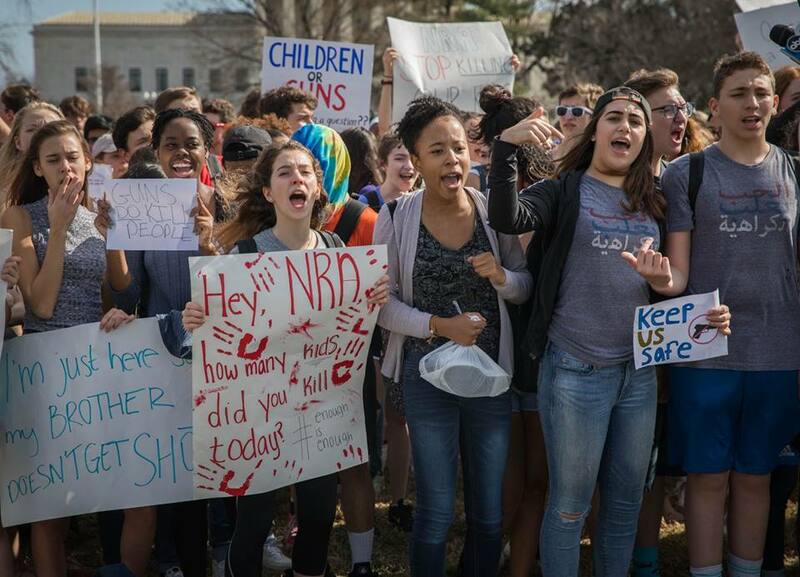 Montgomery County Public Schools students walked out out of school Wednesday to protest against gun violence in Washington, D.C.
Named the “Enough is Enough” rally, students from Montgomery Blair High School, Richard Montgomery High School, and Bethesda-Chevy Chase High School organized the impromptu protest and promoted it on social media and local news. Lead organizer Daniel Gelillo, a senior at Richard Montgomery High School, said that the tragedy in Florida is a turning point for America. “This is the shooting that has galvanized people around the country, particularly young people, to finally demand legislative change. I think that the videos taken during the shooting really put into perspective how horrific these events are, and that change needs to happen,” Gelillo said. Fellow organizer and RMHS junior Rebecca Lacortez expressed similar sentiments on Facebook. “Some things are too important to not talk about, and this is one of them. We need to make sure guns stop falling into the hands of the wrong people,” Lacortez wrote in her post. This is has not and will not be the only student protest. On President’s Day, the group Teens for Gun Reform traveled to the White House for a “lie-in,” where they posed as corpses. National marches have been scheduled for March 24 and April 20, the latter being the 19th anniversary of the Columbine shooting. Gelillo specifically wants to increase background checks and ban assault rifles like the AR-15, which was used in the Florida shooting. Organizers from all three high schools circulated their plan on social media. Students left school at 9:30 a.m. and took the Metro to Union Station. From there, they marched to the Capitol Building. The protest caught the attention of community leaders; Rep. Jamie Raskin (D-Md.-8) spoke at the “Enough is Enough” rally, along with Jen Pauliukonis, president of Marylanders to Prevent Gun Violence. Richard Montgomery Principal Damon Monteleone announced in school Tuesday that neither the school nor MCPS endorsed the protest. Other principals dissuaded students from joining the rally due to safety concerns. “While we support the desire of our students to express their opinions, we do not support students disrupting the school day or doing so in a manner that would jeopardize their own safety,” Blair Principal Renay Johnson said, according to Bethesda Magazine.